In the latest expansion of World of Warcraft, Battle for Azeroth, the Heart of Azeroth and Azerite armour were introduced. The Heart of Azeroth is a legendary neck item that is used to unlock and advance the Azerite system. This system assigns traits to pieces of gear in the Helm, Shoulders, and Chest slots that increase aspects of your character's performance, depending on their location within the tiered-ring system. The Heart of Azeroth is the only neck item that can be obtained in Battle for Azeroth (and so will always be used by all players), while every Helm, Shoulder, and Chest item in Battle for Azeroth has some combination of Azerite traits on it. 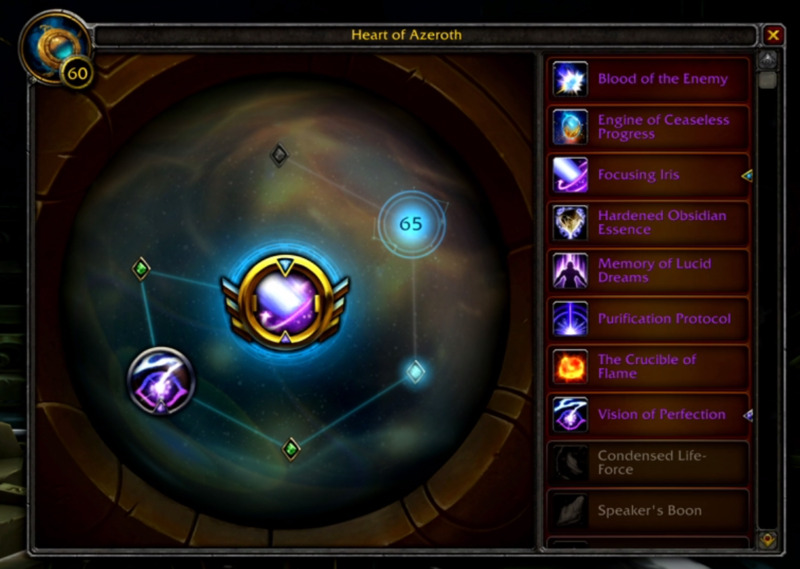 A new system for customising the Heart of Azeroth will be introduced in the form of Essences. Essences function similar to how Glyphs used to, with players obtaining them in a variety of different content and then learning the Essences that drop. Essences will have active and passive components to them, with the aim of trying to have an impact on the rotations of players and giving them additional buttons to press, rather than just passive damage boosts as we previously had with the old system. Players will begin with 1 slot in their Heart of Azeroth for a Major Essence, but 2 additional Minor slots will be unlockable. The first will unlock when you level your Heart of Azeroth to level 55 and the second at level 65. Essences have ranks that can be obtained which will impact the effectiveness of its effects. Rank 1 — This rank provides an ability that corresponds to your role. Rank 2 and Rank 3 — These ranks provide enhancements to the Major and Minor effects of the Essence. Rank 4 — This rank adds a unique cosmetic effect to the spell. There are Essences that are role-specific, while others can be used by all roles. Essences can be changed in a similar way to talents, with an interface that allows you to change them while in rest areas or when a Tome has been used. Essence loot will be restricted to your available roles, meaning a pure-DPS class, such as a Mage, will not be able to collect Tank or Healer Essences. Prior to starting your journey through the Battle for Azeroth zones, you will need to have completed the Battle for Lordaeron scenario, which will unlock the questline to earn the Heart of Azeroth. The questline will take you to Silithus, where you will meet Magni and enter the Chamber of the Heart of Azeroth. Here, you will discover and empower the Heart, earning you your new legendary necklace and unlocking questing in Battle for Azeroth. These are just some of the ways that you can earn Azerite, but it is essentially found in almost every activity in the game, as long as you are in Kul Tiras or Zandalar. As you continue to advance in Heart of Azeroth levels, you will require more Azerite to get through each level. In Legion, a system known as Artifact Knowledge would increase the amount of Artifact Power (now Azerite) you would earn in order to speed up the levelling process for those that were behind. In Battle for Azeroth, the Artifact Knowledge system is still present in effect, but it works slightly differently. Rather than reaching the huge numbers that were happening in Legion, the amount of Azerite required to level your Heart of Azeroth is reduced each week by 30%. This allows players that are just returning or levelling alts to quickly get their Heart up to a competitive level. Each level of the Heart of Azeroth gained through Azerite grants it another 2 item levels. This means that, if you get your Heart to level 20, it will have gained an additional 40 item levels. For each item level, the main and secondary stats on the item will increase. Azerite is not the only way to increase your Heart of Azeroth item level; the Champions of Azeroth reputation will also increase the item level, depending on what your current reputation level is with them. For each reputation level you reach, you will gain an additional 15 item levels, except for when you reach Exalted (when you gain no item levels). This means there is an additional 45 item levels to achieve through this reputation. If you are only concerned with item level, then the only requirement for this reputation is Revered. In Patch 8.1, this progress is now account-wide. If you have unlocked the upgrade quests on one character, it will unlock them on all other characters on the account. You can find out more about this reputation in our Champions of Azeroth guide. Once you have obtained your Heart of Azeroth, you will be able to earn and activate Azerite armour pieces while leveling and at maximum level. These pieces of gear have multiple traits on them that provide offensive, defensive, and utility bonuses that can impact the way in which your class will perform. 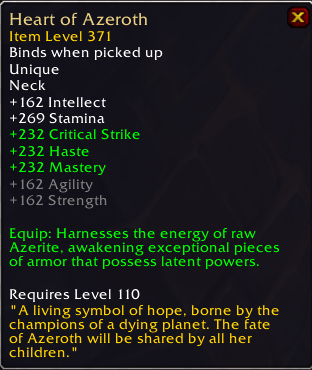 If it is a rare piece of gear, it will have 4 rings of Azerite traits to choose from. An epic piece of gear will have 5. The item level will impact certain aspects of the traits, increasing the power of them to suit the increase in item level. The item level will change the required Heart of Azeroth level to unlock the rings of traits on the piece of gear. Normal difficulty: these will award item level 340 Azerite armour pieces at level 120. Heroic difficulty: these will award item level 355 Azerite armour pieces. Mythic difficulty: these will award item level 370 Azerite armour pieces. Mythic+ difficulty: Azerite armour cannot drop in these dungeons, but you will receive an amount of Titan Residuum currency from your weekly M+ chest, depending on the difficulty level completed. You can read more about this currency below. World Quests: these will award up to item level 340 pieces of Azerite armour, with emissaries granting caches containing up to item level 385 pieces of gear. World Bosses: these will reward item level 355 pieces of Azerite armour, with the Warfront bosses granting item level 370 Azerite gear in Arathi Highlands and item level 400 gear in Darkshore. Looking for Raid: 370 item level. The new raid, Crucible of Storms, has no Azerite gear in its loot table, so Battle of Dazar'alor will remain the best method of obtaining Azerite gear for players wishing to only raid. 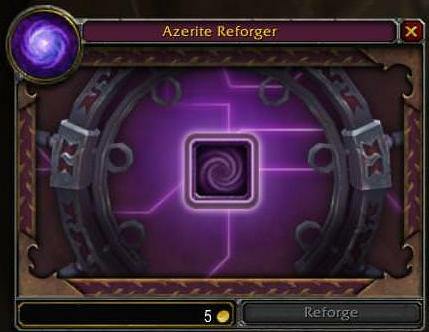 As shown above, players can purchase tokens that generate a random piece of Azerite gear at the chosen item level or they can save up and buy a best-in-slot item level 415 piece of gear, which they can choose from any Mythic+ loot table. Your weekly Mythic+ cache, which guarantees an amount of Residuum based on the completed key level. A Mythic +10 weekly cache grants approximately 625. The weekly treasure map mission from completing the Island Expedition Quest will grant you a mission that can reward Titan Residuum for completing it. Outer Rings: these traits contain the most impactful traits for most classes, with all the content, zone and specialisation-specific traits being on this ring. 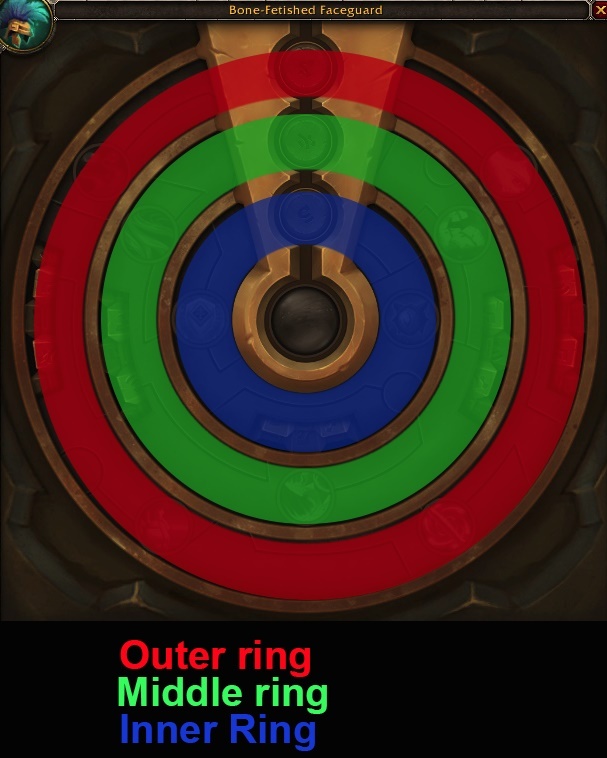 Middle Ring: these traits are shared between roles, with traits that directly impact the output of DPS and healers, or reduce the damage intake for tanks. Inner Ring: all the traits here are defensive traits, regardless of your role or spec. Centre Ring: this trait is the same for all players, on all pieces of gear. It will be the Azerite Empowered, which will increase the item level of that piece of gear by 5. The gear will always move through the rings in the same order when assigning levels for the Heart of Azeroth to unlock traits. The first of the two Outer Rings will always have the lowest requirement, while the Centre Ring will have the highest. Each ring will have a set Heart of Azeroth level that it unlocks at. This level requirement is determined by the item level of the piece of gear and it will increase as the item level does. Currently, Battle of Dazar'alor raid gear has the following level requirements for the 5 rings, depending on the item slot. Raid Finder (370): Level 15, 26, 30, 34 and 38. Normal (385): Level 15, 29, 32, 35 and 38. Heroic (400): Level 15, 30, 34, 38 and 42. Mythic (415): Level 15, 31, 36, 41 and 46. Raid Finder (370): Level 15, 28, 32, 36 and 40. Normal (385): Level 15, 31, 34, 37 and 40. Heroic (400): Level 15, 32, 36, 40 and 44. Mythic (415): Level 15, 33, 38, 43 and 48. Raid Finder (370): Level 15, 27, 31, 35 and 39. Normal (385): Level 15, 30, 33, 36 and 39. Heroic (400): Level 15, 31, 35, 39 and 43. Mythic (415): Level 15, 32, 37, 42 and 47. The Heart of Azeroth levels listed above are in the same order as the ring list we added above this section. The Outer-most Ring requirement caps at Level 15 (depending on the gear slot), which is intentional from Blizzard, as they wanted players to unlock the main damage increase from the first Outer Ring without needing to farm a great deal. If you have made a mistake in your trait selection, want to swap specs, or have just been hit by a hotfix to a trait, you will no doubt want to change the active traits on your Azerite armour. In order to do this, you must visit the Azerite Reforger, located next to the Transmogrification NPC in Boralus (Alliance) or Dazar'alor (Horde). You can reset your chosen powers here and allow yourself to either swap spec-specific traits or select completely new ones on all rings. It is important to note, however, that the price of doing this can increase hugely if you do it multiple times. Every time you reforge a piece of Azerite gear, you will double the gold cost of doing so. The first use of the Reforger will cost only 5 gold, but this can quickly add up to tens of thousands of gold. This cost will slowly decay, halving every 3 days, but this is very slow compared to how quickly it can increase. Make sure you pay attention when making Azerite trait choices, so you do not waste gold on doing it again. To avoid the cost of resetting your Azerite traits, you can simply keep multiple sets of gear and swap between them when you are doing different content. This also works when playing multiple specs. Each of our guides has an Azerite traits section in which you can see the top-performing choices for your spec, as well as a ranking system that will allow you to make the best decisions when comparing pieces of Azerite armour. Below is a list of our Azerite trait pages, with links to each spec for your convenience. 15 Apr. 2019: Minor update for Crucible release, added more info on Patch 8.2 planned changes. 12 Apr. 2019: Added section on the upcoming Patch 8.2 changes to the Heart of Azeroth system. 25 Feb. 2019: Added notes on Titan Residuum, updated item level brackets to Battle of Dazar'alor levels and updated section on obtaining Azerite. 07 Dec. 2018: Added Heart of Azeroth guide.